British photographer Roger Wood (1920-2005) bequeathed his collection of theatre photography to ROH Collections, in recognition of the special relationship he enjoyed with the theatre and its companies. The collection contains colour transparencies, black and white negatives and prints of ballet, opera and theatre productions as well as portraits of dancers, singers, actors, artists, authors and TV personalities. It reflects Wood’s informed and passionate interest in the art forms and their creators. The majority of the collection covers the work of the resident companies at the Royal Opera House, and its touring ballet company. Wood photographed the production of The Sleeping Beauty that reopened the Royal Opera House in 1946. His photographs chart the growth of The Royal Ballet’s repertoire with ballets such as Symphonic Variations, Ondine, Marguerite and Armand and Romeo and Juliet. 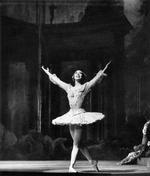 They also show Margot Fonteyn’s development as Prima Ballerina Assoluta of The Royal Ballet, and her partnerships with Robert Helpmann, Michael Somes and Rudolf Nureyev. Most of the photographs are taken from the Stalls seating area, the usual position for photographers. Occasionally Wood was given permission to move elsewhere in the theatre and there are shots taken from higher up in the auditorium and from the wings and the rear of the stage. 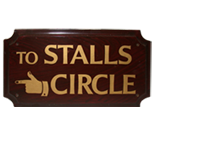 Wood also enjoyed moving the dancers to other parts of the theatre to take their portraits in costume and makeup, juxtaposing the characters of their roles with the workaday world of the building. Wood’s first photographs of the newly formed Covent Garden Opera Company are also from 1946, of the production of The Fairy Queen produced with the ballet company. Subsequently, Wood photographed all the Covent Garden and world premieres of Benjamin Britten’s operas, including Peter Grimes, Billy Budd and Gloriana. Wood was a frequent visitor to Aldeburgh and his friendship with Britten and Peter Pears resulted in some delightful informal photographs of the pair with friends and colleagues at the Red House. Wood’s photographs include Maria Callas in her Covent Garden debut in Norma in 1952, and her subsequent appearances as Violetta in La traviata, some of these latter taken on stage during breaks in rehearsals. Wood seems to have been an accepted presence on stage with his camera as he manages to capture moments when directors such as Franco Zeffirelli and Luchino Visconti are making adjustments to costume or are deep in discussion with an individual performer. The collection includes photographs of visiting companies to the Royal Opera House. Those of the opera of La Scala, Milan, show Tito Gobbi making his debut at Covent Garden as Belcore in L’elisir d’amore, and Ramon Vinay and Renata Tebaldi in Otello in 1950. Wood also photographed ballet and opera elsewhere, such as the D’Oyly Carte Opera Company, Glyndebourne Festival Opera, and Ballet Rambert. In 1983 he went to Bayreuth to photograph Peter Hall’s production of ‘The Ring’, Wood’s last theatre work. The drama work is almost exclusively of the early years of the Old Vic company (Royal National Theatre) and the Royal Shakespeare Company. The Old Vic material includes photographs of Laurence Olivier, John Gielgud, and Richard Burton. Wood worked as a theatre photographer from 1946 to the late 1960s. After that, he specialised in archaeological photography, working in the Middle East and producing several books on North Africa and the Middle East. From 1974 to 1988, he also worked as photographic consultant to the Ministry of Information in Oman, and his advice and photographs helped establish the national museums in Muscat, Doha and Riyadh. Wood had a life-long love and appreciation of the theatre, and in particular of ballet. Following his retirement, he continued to supply prints for exhibitions at the Royal Opera House and enjoyed the appreciation that his images invariably inspired. In the 1980s Wood deposited some negatives of his dance work with the Dance Division of the New York Public Library of the Performing Arts. Prints exist in theatre collections and museums throughout the UK; the bequest to the Royal Opera House of the majority of his theatre work, together with the copyright, has enhanced ROH Collections’ coverage of a rich period in the history of the building.